A view of Temple I with Central Acropolis buildings in back, part of the ancient Maya site at Tikal, Guatemala. Courtesy of Wikimedia Commons. Maya farmers in the area, who rely on rainfall to nourish crops, offer up different prayers. 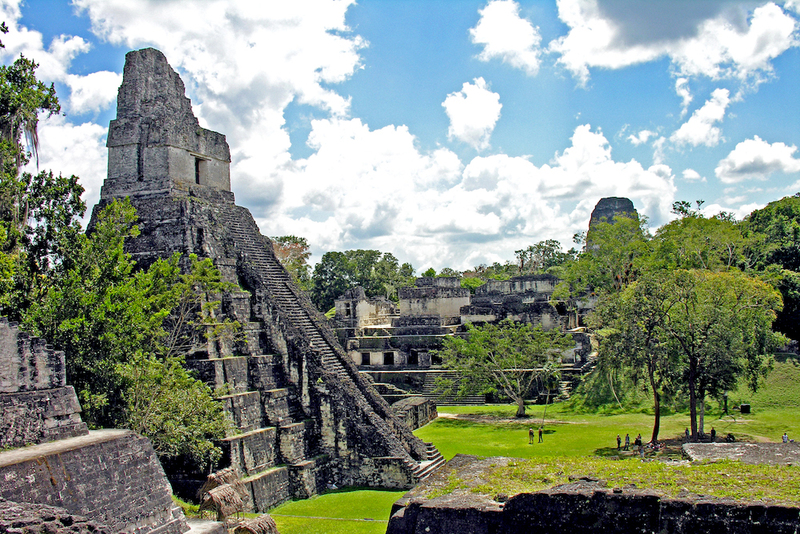 For over 4,000 years, Maya families, commoner and wealthy, have relied on water from the skies. Without rain, crops are decimated, river trade ceases, and drinking supplies diminish. Extended dry seasons create a massive tinderbox where one lightning strike can destroy everything in a blazing inferno. In my anthropological work in Central America, I have spent nearly 20 years looking at the role that water played in Maya history. Water and environmental crises that arose in the region more than a thousand years ago shed light on key parts of the Maya belief system, which offers some useful perspectives on responding to climate change in the 21st century. The Maya managed to build an early civilization that farmed beans, corn, and squash—sometimes using advanced techniques like terracing and raised fields. More famously, during the Classic Period from the third to the late ninth century in the southern Maya lowlands (comprising present-day northern Guatemala, Belize, and southeastern Mexico), the Maya built hundreds of urban centers. Each center had a king, as well as royal temples and elaborate tombs, palaces, inscribed monuments, and large reservoir systems. The most powerful kings emerged and thrived in areas with large amounts of fertile soils for agriculture. Such places didn’t necessarily have fresh water nearby. In fact, the two largest Maya centers with the most powerful kings, Tikal in Guatemala and Calakmul in Mexico, emerged in areas without lakes or rivers. But successful Maya royals had to have access to water to retain control. As well as being sources of water, these centers became the sites of community interaction, including markets, ballgames, and ceremonies that took place in large open areas surrounded by temples and the royal palace. The region had a fantastic variety of plant and animal life, which was widely scattered, as were farmsteads and subjects. Reservoirs brought people together, fulfilling both agricultural and political needs. While lots of rain falls during the seven-month rainy season, much of it seeps into the porous limestone bedrock. In areas without lakes or rivers, the Maya devised means to divert and contain water beginning over 2,000 years ago, eventually resulting in the development of intricate catchment systems centered on large reservoirs. From the third to the late ninth century, classic Maya kings depended on these reservoirs to attract subjects to urban centers during the five-month dry season between February and June. Quarrying the reservoirs also provided stone to build monumental temples, palaces, and ball courts next to them, allowing kings to directly control their access. The Maya accomplished all of this with only stone tools, human labor, and ingenuity. Across millennia, the Maya also lived their worldview, a cosmology of conservation in which humans constituted one of many elements along with animals, birds, trees, clouds, stone, and earth. Humans were not seen as superior to other life forms or elements in this system, and they had a responsibility to maintain the world they shared. This relationship is expressed even today in the nature of current Mayan languages. Among the Tojolab’al Maya of Chiapas, Mexico, for instance, their linguistic structure de-emphasizes the role of the individual as an actor and instead emphasizes a collective “we.” That “we” includes clouds, plants, rivers, mountains, and animals. They do not have terms for “religion” nor “nature,” as these concepts are already integrated into their daily interactions with the world. What the Maya learned, which we continue to struggle with today, is that ignoring long-term climate crises for political gain is short-sighted, and ultimately destructive to a political system. This cosmology and the Maya transformation into many kingdoms worked in sync for centuries. As the population grew, the Maya expanded their water systems, which became inextricably linked to urban layout—dams, walkways, and channels—and royal power. Reservoirs supplied water to tens of thousands of people in larger centers for nearly a thousand years. Yet the more that Maya kings relied on increasingly complex water systems to support their political economy, the more vulnerable they and their subjects became to disruptions. And disruptions did come, in the form of several multiyear droughts beginning early in the ninth century. Maya farmers, who had contributed their labor, services, and goods for access to water during annual droughts, ceased to do so when kings failed them as water managers. Gods and ancestors were believed to have deserted royalty, which had not maintained beneficial long-term relations with the environment. An urban diaspora resulted, as hundreds of thousands of Maya abandoned hundreds of centers and kings in the dry southern lowlands. They never returned. We know the long-term Maya cosmology and the land management strategies that accompanied it worked on a practical level, because Maya culture did not die out with the demise of kingship. Maya farmers emigrated in all directions and started new lives near lakes, rivers, and coastal areas. Temples and palaces were surrendered, eventually becoming overgrown and swallowed back into the rainforest, while existing political structures vanished. Kings disappeared for good in the southern lowlands, as people carried their languages, their cosmology, and their agricultural methods to new areas, where they have farmed the land sustainably for more than a thousand years post-collapse. Millions of Maya currently live in Central America and elsewhere. The Maya paid attention to diversification in ways that might be familiar to us today. For instance, we are taught to diversify our financial portfolios to avoid risk, as well as our diets and exercise regimens to preserve our health. The Maya had a similar concept, except that it was applied on a daily basis to maintaining universal balance. The Maya plant their home gardens and fields to mimic the diversity seen in the jungle, which likewise serves as a risk management strategy. The Maya also limited their interaction with the environment: They did not hunt, cull, or farm in ‘sacred’ places, such as pilgrimage destinations located along ceremonial circuits. Consequently, flora and fauna flourished, which promoted biodiversity and conservation. I work in one such area—Cara Blanca in central Belize. There, openings in the earth, such as caves and bodies of water, are considered portals to the otherworld where Chahk resides and people communicate with ancestors and gods via prayers and offerings. People lived near shallow Cara Blanca lakes, but only periodically visited cenotes (deep collapsed sinkholes fed by groundwater) to commune with gods and ancestors. These pilgrimages increased in number and scale during the century-long period of droughts. For the first time, the Maya infringed on a sacred place. They built water temples and other ceremonial buildings. However, when conditions worsened as droughts wore on, they never built houses nor farmed there. Even then, their worldview emphasized maintaining a balance, sometimes at short-term expense to their own well-being. The Maya cosmology of conservation is not often found in our industrial world, which embodies a worldview in which nature is divorced from culture, prioritizing humans over everything else in a manner that is becoming less sustainable each day. What the Maya learned, which we continue to struggle with today, is that ignoring long-term climate crises for political gain is short-sighted, and ultimately destructive to a political system. More centrally, maintaining an ecosystem is not merely the responsibility of a society’s leaders but requires sustainable practices—and sometimes sacrifices—from everyone. Of course, the Maya made mistakes and overused resources at times. But they learned from their mistakes, repositioning their actions to avoid upsetting the balance of their world. Today, adopting and updating their approach would be a good start in the vital task of saving not only ourselves but our planet. Lisa J. Lucero is a professor of Anthropology and Medieval Studies at the University of Illinois at Urbana-Champaign.